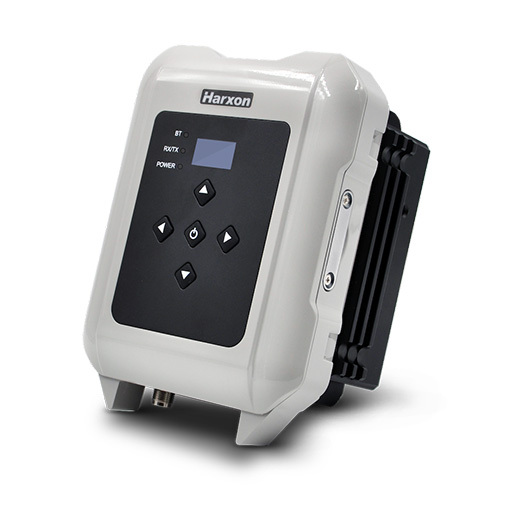 Harxon eRadio™ has enabled with intelligent serial baud rate identification for different RTK devices. It can automatically identify RTK serial baud rate with radio data cable and provide a plug and play form for easy connection between eRadio™ and RTK. Due to high transmitting power from 5W-35W, transmission data can be up to 19200bps/s over connection distance between 50 to 80 kilometers depending on the environment. The eRadio™ offers surveyors an easy-to-use radio modem that provides dependable performance as either a base, or repeater working with other Harxon radio modems in challenging environments. In the store and forward operating mode, eRadio™ receives messages, buffers the received data, and transmits further to another substation. The user programmable eRadio™ also supports the Bluetooth of APP to configure data and updates radio status. Its diagnostic reporting software can realize the built-in reliability monitoring, such as internal temperature, environment status, battery level and channel inspection etc., these features allow users to both anticipate and deal with potential issues efficiently. In addition to compatible with radio protocols by Trimble® and Satel®, eRadio™ is also equipped with its unique ETALK communication protocol, which used Harxon’s exclusive algorithms and advanced processors. Under the same conditions, ETALK protocol can significantly reduce the BER of weak signals and the communication distance can be increased by 20%. The compact, rugged eRadio™ is particularly well suited for heavy-duty outdoor use. It is designed for easy mobile use with OLED display screen in demanding field conditions. The IP67 full metal cover provides dust and water resistance that keeps surveyors working with confidence and efficiency.